We've been in our townhouse for almost 3 years. To be honest, I wasn't thrilled that we were moving from one townhouse to the next, but I was excited about owning our home for the first time. I hate townhouse living. I hate being attached to someone. I hate the narrow backyard. I hate worrying about the dog barking at all hours of the day, or the kids kicking soccer balls against the wall. It's all just... too close for comfort. My husband will often joke, "Do you even like this house?" and the answer is yes, yes I do. I actually do. We've put a lot of work into this house and have changed so much in the past few years- but it's tight, and it's loud. Like SO loud. With 2 grown adults, 2 kids, 2 cats and a dog- I already feel like this house is bursting at the seams. The thought of my boys getting any bigger, any louder or more rambunctious sends me into instant panic attack mode. Sometimes, I feel like we've already outgrown this house, as crazy as it seems. Yes, I know this makes me sound like some awful ungrateful brat, but let me just tell ya'll it is some real tight-knit community living up in my house. The acoustics are enough to make your ears bleed when the kids are running around like chickens with their heads cut-off and the dog is barking nonstop at every single thing passing on the road. 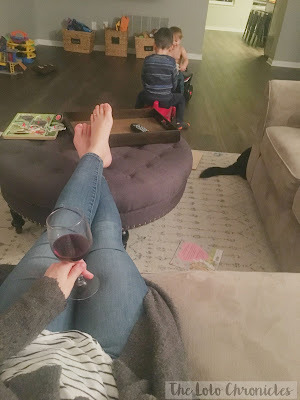 There's a reason why I never really host playdates- my house would probably crumble to the ground with three more bodies barreling from room to room. This little house just can't take it. (Neither can my head). But once in a blue moon I'll get this most perfect view. Central to everything. Hearing the laughter and squeals from my boys who are riding back and forth from one room to the next. I get a brief moment to enjoy it before someone falls and cries or jumps on the couch and spills my wine. It makes me love our little house because we're always together. Always close. It made me think of that 90's country song "Little Houses". Yep. I totally went there. Where you eat and sleep so close together. Oh, and if we had more room between us, think of all we'd miss. Love grows best, in houses just like this." Now the level of "communication" that goes on in our tiny house is a whole lot of shouting (I don't remember Bill and Sue ever screaming over their kids and a dog that never shuts up) but regardless of the noise, it's cozy and quaint. And I do love it. And sometimes it's just nice to sit and appreciate what we've built together for our little family and really enjoy being together. Our little, loud, crazy family in our little house. I’m Lauren (Lolo). I’m a mama of two boys (1 & 4) living with my husband in Virginia. I'm a SAHM, business owner and blog in my sleep. I’m surviving motherhood one glass of wine at a time and documenting my journey along the way. Visit The Lolo Chronicles's profile on Pinterest. blogger theme by Designer Blogs. © Lauren Valentine, 2015. All rights reserved. Powered by Blogger.